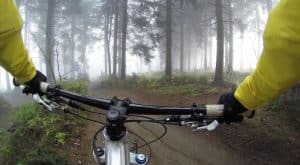 Mountain bike grips are often overlooked, however they represent one of the key points of contact between rider and bike, and have the potential to make or break a day out on the trails. The perfect pair of grips will provide you with optimal control while also improving comfort. 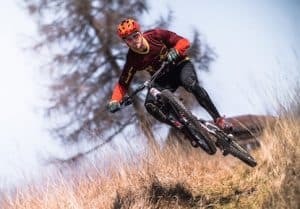 Whether you have recently purchased a bike and recognise new grips as an “easy-win” for an upgrade, or your current ones are worn down to the bar and you’re finally looking for some replacements, the below article will hopefully provide with you some valuable information in finding the best MTB grips for your needs. After the summary table below we discuss some of the key things you should look out for when choosing your grips, followed by our detailed reviews. 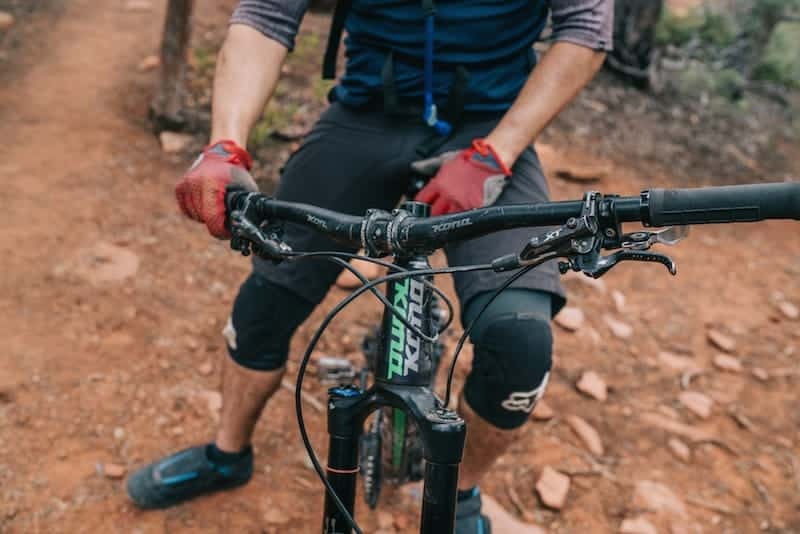 While they might seem like a fairly simple accessory, there are a number of features that can really influence how your grips will perform for you out on the trail. 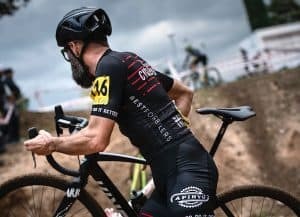 Keep an eye out for the below during your buying process to ensure you choose the best MTB grips to suit your requirements. No one wants their grips moving around on the bar while in use. 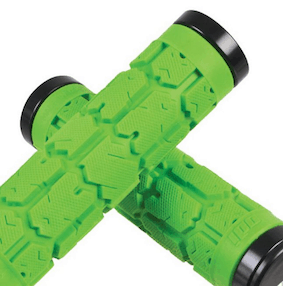 That is why everyone serious about their mountain biking these days will opt for lock-on grips. Lock-on grips clamp onto the bar in your desired position meaning they won’t budge no matter how hard you twist, push or pull. However within the world of lock-ons, you have the further choice of single or double clamp i.e. locked to the bar at both ends of the grip or just one. Single clamp will be slightly lighter however you run the risk of the lock not being as solid. Most of the best lock-on grips are double clamp however there are also some great single clamp options out there. When choosing your grips, you want to find ones that are soft enough to absorb a lot of the vibration coming up through the frame, while also providing the required level of feel and control. A rubber compound is generally the go-to material for the top bike grips, however be aware that it will wear out over time. The length of your grip may vary depending on your bar and hand size. Generally grips come in at around the 135mm mark in length. 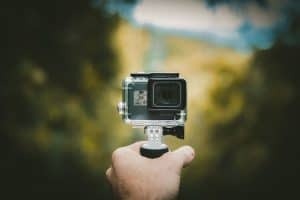 Now you know some key things to look out for, here are some of the top products on the market. 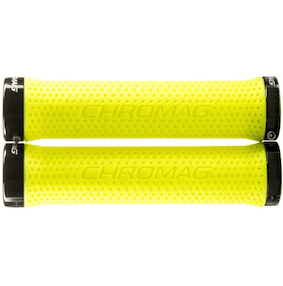 ​One of the most popular grips on the market today, the ODI Rouge Lock Ons provide the perfect balance between comfort, performance, and durability. They are soft, chunky grips but are also tacky, meaning they would also be suitable for riding without gloves. In terms of softness, they sit in the middle of the range of ODIs range of grips. 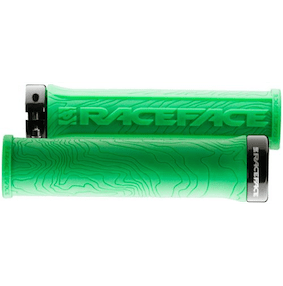 ​Vancouver based Race Face produce some of the best mountain bike products on the market and the Half Nelson grips are no exception. 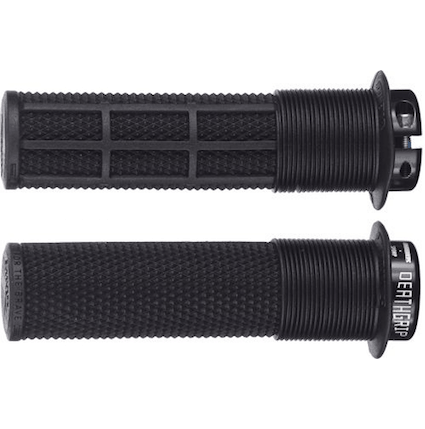 These grips are lower profile in design and feature a single lock as opposed to double. Both of these features reduce weight, while the slim design will suit those with smaller hands or those who dislike the chunkier style grips. Like all Race Face grips, the Half Nelsons are super tacky meaning slippage won’t be an issue. 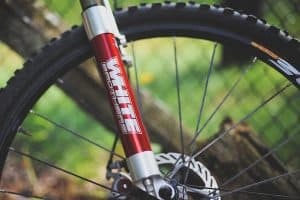 ​A collaboration between DMR Bikes and 2006 Junior World Cup Champion Brendan Fairclough, these grips provide an excellent all-round option. There’s a lot going on with these grips. They have three different grip patterns specifically designed to provide grip and comfort in all the right places. Waffle and Knurl for grip, Mushroom for comfort, it’s clear these have been designed by a rider. The Death Grip is single lock however DMR assures us there’s no need for a second lock due to the tapered core. ​The only grip on our list with a dimpled pattern, the Basis Grip from Chromag is another great low profile option. 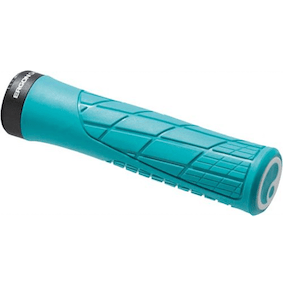 Tacky yet durable, these grips are a great all around grip for those who want something that will serve them for years to come. ​German brand Ergon are famous in the cycling world for producing super-tech ergonomically inspired grips and saddles. The GA2 are one of their less extreme offerings, being closer in style to the traditional bike grip. However they still integrate ergonomic contouring that fits the riders hand and reduces strain and cramp. If you suffer from hand or arm strain from uniform style grips it may be worth checking out the GA2s. At trivial as they may seem, it’s worth spending a bit of time deciding on your grips, as you’ll be stuck with them for a while. If we had to choose one set, we’d go with the ODI Rogues, as we’re big fans of the soft, super tacky design and like the security of the double lock. But when it comes down to it, we’re all different, so do your research and pick the best option to suit your needs!